Forty-five international artists = endless coloring variety and inspiration! 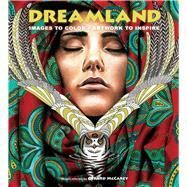 Offering a wide range of illustrations, Dreamland gives coloring fans an international art gallery with a feast of stylistic options. From abstract patterns to nature drawings and modern artwork, these pages provide enthusiasts with imagery to soothe, challenge, and engage their creative side. For each contributor, there’s a photo, short bio, and an inspiring piece of art. Packaged and designed with a high-end sensibility, Dreamland is a perfect book to use for décor and display—whether to share the work of these talented artists or to show off your own coloring skills.